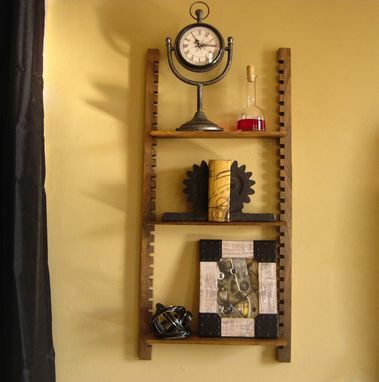 Textured modern rustic cog shelf is full of steampunk design elements. 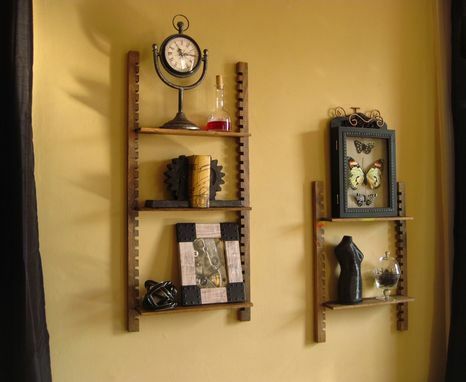 Cantilevered shelves carry plenty of weight and fit tightly into wooden cog-like supports mounted to the wall. 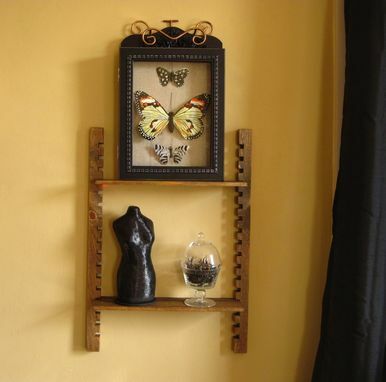 Put your favorite steampunk clothing accessories and decor on display. The industrial style wood supports create a ratcheting visual effect that adds a live motion element to your room. Your steampunk decor will appear to be floating up the ladder-like structure. Stagger the vertical supports on each individual shelf to increase the dramatization. -Cog supports mount securely to any wall. -Adjustable shelves move to any height adjustment easily without removing cog supports. -Easy to hang! Installation instructions included plus heavy-duty mounting hardware. -The texture is rough cut, but the refined clean edges boost modern appearance. 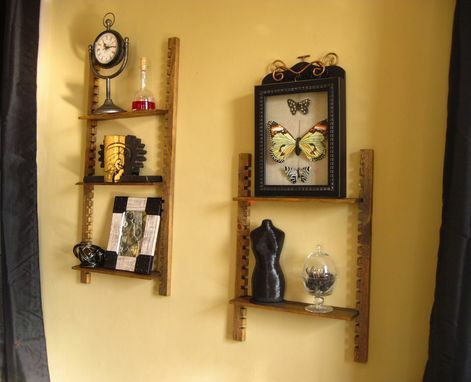 -Cantilevered shelves have mill marks to tie in industrial production styling. -Old world used look applied by hints of distressed wood. Mount shelves evenly and add mason jar planters and other country decor. Materials are produced by a saw miller local to Southern, NH. Shelving handmade in New Hampshire. 4" x 4" x 40"
Note: Decor not included with shelves.